All aboard for comedy, music and dance! Jimmy Cricket is starring in a “royal” variety show this summer to mark the Queen’s Diamond Jubilee year. 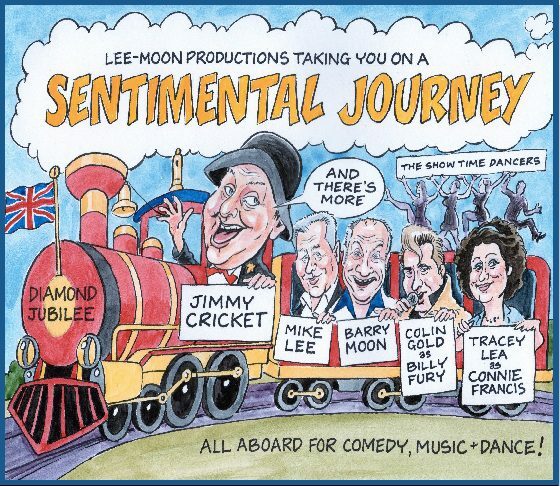 The family entertainment extravaganza, Sentimental Journey, is at the Royal Hippodrome Theatre in Eastbourne, East Sussex, from 1 May to 26 September. And it will take the audience on a nostalgic trip back to the 1960s and beyond. Jimmy will be joined by fellow comedians Barry Moon and Mike Lee, world-renowned tribute acts Colin Gold and Tracy Lea – who perform as Billy Fury and Connie Francis respectively – and the Show Time Dancers. Colin, who starred on ITV’s Stars in Their Eyes, has gone on to become one of the most experienced and acclaimed Billy Fury acts in the world. Halfway to Paradise was one of Fury’s best-known songs. Stars in Their Eyes was a British television talent show that was screened on Saturday nights from 21 July 1990 to 23 December 2006 and in which contestants impersonated showbiz stars. Connie Francis’ greatest hits included Who’s Sorry Now, Lipstick on Your Collar and Stupid Cupid. Performances are at 8.15 each night. Tickets cost £12 and £17 – go here for more information.